The copyright of images on this website are owned by the individual photographers. No image may be copied, duplicated, modified or redistributed in whole or part without the prior written permission of the photographer. 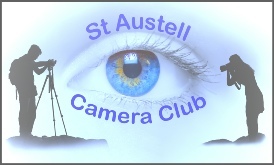 DISCLAIMER: St Austell Camera Club has no responsibility for the content of other websites linked from this site. An eclectic mix of links here, other link suggestions most welcome. “Speranza” are local printers in Fore Street St Austell. Discount for Club members.